Verbatim has announced the Store 'n' Go Clip-it USB flash drive, which can do double duty as a paper clip. 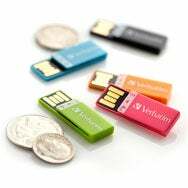 USB flash drives come in all kinds of shapes and sizes--tiny slivers, key-shaped, coins, even as rubber duckies. If you ever wanted a USB flash drive that can double as a paper clip, then your wish came true on Tuesday. Verbatim has announced the $20 Store 'n' Go Clip-it USB flash drive, which can do double duty as a paper clip. Now, with the ongoing effort towards a paperless office, why would you need a flash drive that can act as a paper clip? There are several fields where paper use has been reduced but still necessary--law offices, estate agents, accounting, just to name a few. For example, if you can present a package of printed photos, you can save the digital copies to the Store 'n' Go Clip-it and clip the drive to the package. It makes for a tidy presentation. The Store 'n' Go Clip-it is available in 4GB capacity and in black, blue, green, orange, and pink. Verbatim says the drive will be available in December.